One of my favourite crafty books is this one. It inspires me a lot, in terms of colours, designs, etc. More of all, it shows me that sewing/quilting should be done YOUR WAY. No quilt police to tell you that your sewing must be 100% accurate, that your colours must consist of this & that, that your blocks must be true & true traditional, etc. The quilts are very different from the ones I see displayed at the quilt shops/workshops. 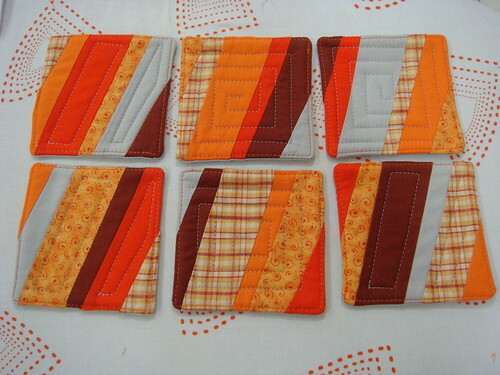 DS’ quilts are so refreshing & modern and I simply want to try each and every one of them. Well, looking at the book, I thought: geez, I can make these coasters in 15 mins. I was SOOOOOO wrong. I ended up slaving away the entire evening over this set of 6 coasters. Step 7: Trace pattern (mark out the 1/4″ points too) on the top piece of fabric with water soluble pen & then cut them out. I rotary cut the 6 layers of fabrics. Step 8: Switch the pieces around to make sure each top will have a different combination of fabrics. ← 1st post of 2009! I love these! Don’t you wish all craft books came with pattern pieces? At least you could skip step 1.